Retro and progressive. Serious-yet slightly mischievous. That's PFR, then as a distinguished pop-rock band of the '90s, and that's PFR now, as they return for their first studio album in three years. The Bookhouse Recordings finds PFR creating new interpretations of their most popular hits while adding three original songs to a renowned catalog. It's a trophy heralding PFR as one of Christian music's most enduring bands. A self-produced project, The Bookhouse Recordings emerges as a unique creative opportunity for members Patrick Andrew (bass), Joel Hanson (guitar) and Mark Nash (drums). After 2001's studio reunion for Disappear, the band never completely went their separate ways. Each member enjoys a thriving music career, yet the trio still performs together four or five times a year, including AtlantaFest 2004 and a recent date with Jars of Clay. "We all love making music together," Joel says. "We're all very different people, and I think that's what makes the cool symmetry between us, whether it's in the studio or playing live." For the new album, the band re-imagined seven of its classic radio hits and most popular songs, gems like "Wonder Why," "That Kind of Love," "Great Lengths" and of course, "Pray For Rain." "This was mostly about stripping everything away to its most raw form and putting a different light on the song or presenting it from a different angle," Patrick explains. "The point was to concentrate on the songs themselves, updating them and giving them new life." "Working with these songs again was like a flashlight you pull out 10 years later and the light still turns on," Joel says. "You're almost surprised there's still juice in those batteries. The old songs still had that energy to them. 'Re-juicing' them gave us the opportunity to continue to create honest music." Three new songs blend faithfully with the "re-juiced" PFR standards. Each honors that signature PFR sound-crisp, Brit-pop melodies and one-of-a-kind harmonies. Immediately, the songs feel broken in, like a favorite leather baseball glove, but are fresh and relevant to today's music scene. "In the Middle" is a vulnerable song about self-discovery. The intimate "Home" pays homage to family. The last song recorded, "Prayer For Beslan," is a raw reaction to the tragic September school siege in Beslan, Russia. The tragedy claimed 344 victims, many of them children. "Listening to these three new songs is like getting a glimpse of our three individual personalities," Mark says. "All three of us are fathers now. Patrick brought 'Home,' and it's very much him. Joel brought 'In the Middle,' considering some things he's been thinking about, and I brought the music for 'Prayer For Beslan,' which is different for us. We'd never written a song based on a current event. Coming together as a band to finish the tracks creatively unified them for us." A unified PFR will thrill the hearts of fans and will no doubt earn the trio new enthusiasts, too. The band's surprising departure from recording in 1997 felt like the end of an unfinished symphony. Having arrived on the national scene in 1992, this critically acclaimed Minneapolis-based trio accumulated six #1 hits (including "That Kind of Love," "Great Lengths" and "Forever"), a Dove Award for Rock Album of the Year (Pray For Rain) and a Grammy Award nomination during its run. But after touring virtually non-stop for five years, the band called it quits, and each member forged new opportunities. They remained friends, though, and the space enabled them to retool for the 2000 single,"Kingdom Come," a contribution to the Roaring Lambs compilation, a project honoring the late author Bob Briner and his influential book of the same title. The moment also inspired the band's 2001 reunion project, Disappear. 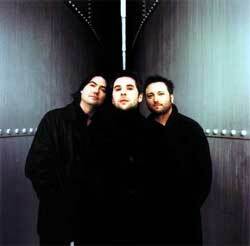 Since then, Patrick, Joel and Mark have enjoyed uniting as PFR as their schedules have allowed. Meanwhile, each member leads a full life filled with various ministry opportunities, individual musical pursuits, and most importantly, his role as a husband and father. Patrick works today as a worship leader at McDowell Mountain Community Church in Scottsdale, Arizona. "We moved here in 1999, and this church is awesome," says Patrick. "My wife and I have been through a lot in the last couple of years, and they have been amazing." Two years ago Patrick and his wife, Helen, lost their daughter, Chesna Angelina, at birth. The following year, their son, Everett, was diagnosed with autism. Patrick says he and Helen work every day with Everett to improve his quality of life, and their oldest daughter, Olivia, helps in the process as well. "I think Patrick's more broken than I've ever seen him, for better and for worse, and I'd take him with both," Joel says. "I'm grateful for his willingness to stay in it even though it's really, really hard. I hear his voice now-there's such a sweetness. He just becomes a better and better singer and an even more prolific songwriter." The cathartic There and Then It's Gone, Patrick's recent critically acclaimed independent solo recording, plumbs his grief and rises to new hopes. "I get to do for a living what I love to do, make music," he says, "and I've fallen in love with just singing to God." Following PFR, Joel worked as a publishing house staff songwriter for four years and part-time as a church worship pastor. He lives now in the Minneapolis area where he works full-time for Church of the Open Door. "I have a chance to be a part of a community and use art and music as part of the voice for that community. It's really a great opportunity." The father of two daughters, Halle and Maggie, Joel continues to be a prolific songwriter, having recorded two independent records in the last three years. His solo debut, Captured, released in 2000 followed by Broken in 2003. Joel and fellow Minnesota resident Sara Groves also recorded the title track for the Traveling Light project (Creative Trust Workshop), inspired by the Max Lucado best-seller of the same name. The song became a hit on various Christian radio formats. "Joel's always growing," Patrick says. "He's always struggling with his faith, trying to get closer to God. That's always been an encouragement to me to do the same thing." Mark makes his home in Nashville and is married to Leigh Nash, former lead vocalist of the recently disbanded Sixpence None the Richer. Together they opened The Bookhouse recording studio in their eastside home, tapping into the rich rock scene Nashville rarely gets credit for nurturing. "There's a great community of young, cool, relevant rock bands here, and I've been fortunate to go through the list and work with many of them," says the self-identified iPod geek. "It's kept me busy and that's great, because it's what I love to do." Additionally, Mark has worked with Leigh to create music for commercials, movies and TV. Along with Tonic's Emerson Hart, he co-produced the main theme for NBC's "American Dreams" and recorded the track at The Bookhouse. "Mark has become this great studio owner," says Patrick. "He's really good at what he does." Joel agrees: "Mark's a gifted player, writer, producer and engineer, which is cool because he always wanted to be more than just a drummer, and I think he's found the space to become that." As a band, PFR has made a unique and indelible mark on the landscape of Christian music. As individual men, Patrick, Mark and Joel continue to use their singular gifts to follow God's leading in the spheres He has placed them in. And as friends and brothers, they continue to make music together that resonates with creativity and honesty. Joel concludes, "All of us, I think, have found a spot where it's just a lot easier to be for each other than just for ourselves. Bands always struggle with that, and it changes with maturity. I think that's the most significant difference about PFR today. We're more of the men we've always needed to be, as people and musicians. I'm thankful that in the midst of finding some of those things in ourselves we've had the chance to share them with each other, and I hope we'll continue to share them for a long time."